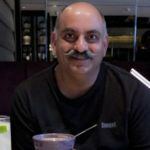 Mohnish Pabrai lives in California. However, his heart is in Dalal Street. Mohnish candidly admitted to the members of his PMS Funds that he is smitten by Indian stocks. “I love what we own in India. We’ll make a lot of hay from our Indian holdings in the years ahead,” he said. 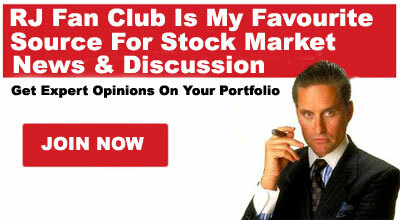 At the same time, he was dismissive about foreign stocks. The result is that Mohnish has been slowly and steadily dumping the foreign stocks in his portfolio. 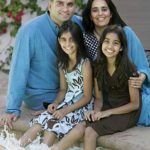 According to the sleuths of seeking alpha, Mohnish now has only two foreign stocks in his portfolio, namely, Fiat Chrysler and Ferrari. Three stocks were put on the chopping block. These are Alphabet Inc., Southwest Airlines and AerCap Holdings. Due to this, the portfolio value has plunged from $386M to $317M. It is anybody’s guess how long Fiat Chrysler and Ferrari will retain their coveted position in Mohnish’s portfolio. We shouldn’t be surprised if one fine day he unceremoniously dumps these stocks as well! 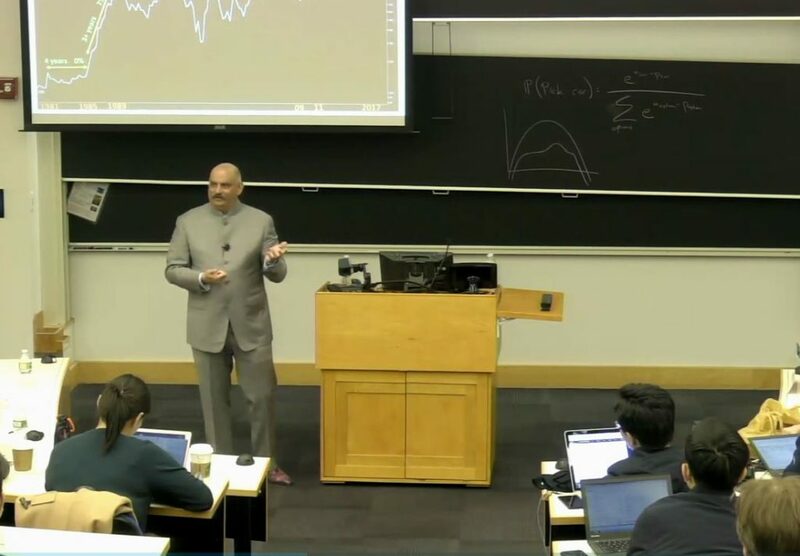 Mohnish recently delivered a talk at the elite Columbia University in which he described housing finance stocks in India as “no brainers”. 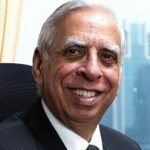 “As India rises, it is a no-brainer that people will want good housing and it is a no-brainer that they will have to finance it because there is no way that they can just buy it with their income levels …..
…. The housing finance sector will grow at 3 or 4 times GDP growth. So, if India is growing at 7%, the housing companies may be growing at 20 to 30%”. Prof. Bruce Greenwald, the eminent global authority on value investing, was one of the dignitaries on the dais. 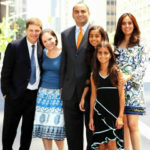 While Prof. Greenwald may not be familiar with Indian stocks, he knows good value when he sees it. He vigorously nodded his head in affirmation of Mohnish’s theory. Mohnish normally likes to come personally to Dalal Street and buy his entire quota in a bulk deal. However, in the case of Repco Home Finance, Mohnish was keen to keep his buying a secret. 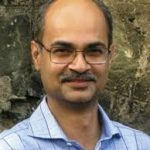 He roped in six of his funds named Pabrai Investment Fund II LP, Pabrai Investment Fund 3 Ltd, The Pabrai Investment Fund IV LP, Dhando India Zero Fund LP, Dhando India Zero Offshore Ltd, Dhando Holdings LP and Dhando Holdings Qualified Purchaser LP, to buy small bits and pieces of the stock so as to fly under the radar. Of course, Mohnish’s attempt at secrecy was futile because it is not possible to keep anything a secret from the ace sleuths of the RJ Fan Club for too long. We tracked down the official disclosure made by Mohnish to the BSE which reveals all details of his purchases. As of date, Mohnish holds a treasure trove of 32,31,728 shares of Repco comprising 5.16% of the equity capital. The investment is worth Rs. 184 crore at the CMP of Rs. 568. Basant Maheshwari was the first discoverer of Repco Home Finance’s potential. He recommended it as his “best pick for 2014”. “Against its issue price of Rs172, the stock is currently trading at Rs 292, translating to 12 times estimated FY15 earnings per share of Rs 25 and at around 2.1 times projected FY15 book of around Rs 140. Repco surged to an all-time-high of Rs. 725 on 8th January 2018, fulfilling Basant’s prophecy of multibagger gains. It is presently resting at Rs. 568. Basant has since shifted his allegiance from Repco to PNB Housing Finance. However, this has no consequence because Basant regards stocks as “tickets to creating wealth” which are swappable with each other. The latest investors’ presentation reveals that Repco is getting its act in order. The Q4FY18 results are quite impressive on all fronts. In addition, R.Varadarajan, the MD & CEO, assured that the Company will reduce cost of funds and improve spreads. He also assured that the Gross NPAs will be brought below 2% in FY19. What about Shyam Sekhar’s allegation that Repco HF is a “huge scam” and upto “dark deals”? Shyam Sekhar shocked his followers by suddenly alleging that there is a “huge scam” in Repco Home Finance and that it is indulging in “dark deals”. Huge scam in Repco home finance. Raids by CBI. I always knew this Co was upto dark deals. Fortunately, the allegation turned out to be a false alarm. The CBI gave Repco a clean chit and closed the FIR on the basis that there was a “mistake of fact”. 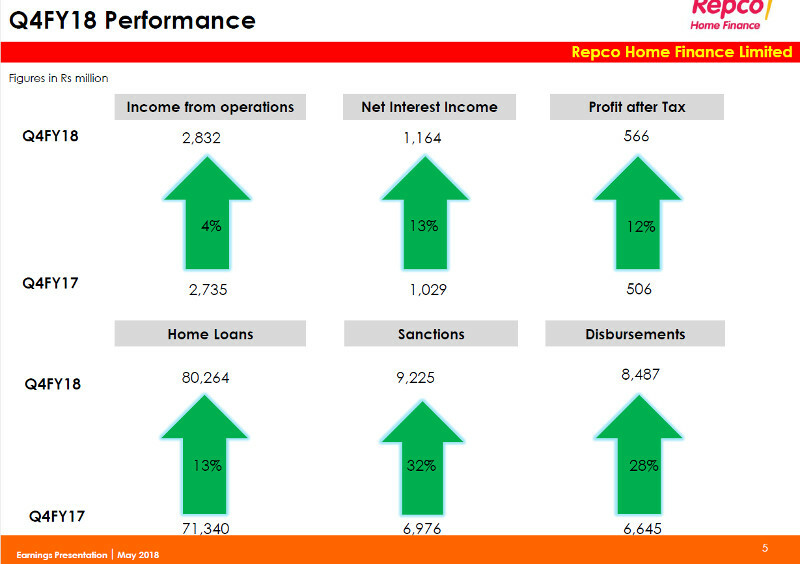 In addition, Motilal Oswal has given cogent reasons as to why Repco Home Finance is a good buy. Mohnish, like all other stock wizards, is bullish about the agriculture sector in India. In an interview with Tanvir Gill, Mohnish stated that the Indian agricultural sector is a huge portion of the economy and has great potential. Mohnish’s game plan is to tuck into agriculture stocks where there is “value addition”. KRBL is a textbook example of this. The Company buys raw basmati rice from farmers at throwaway prices and sells them to affluent consumers under branded names like “India Gate” at exorbitant premium. The huge profit margins made from the so-called ‘value addition’ has led KRBL to give magnificent 35-bagger gains to investors over the past ten years. Mohnish bought a massive consignment of 64 lakh shares of KRBL for his Pabrai Investment Funds on 12th February 2018. He has invested Rs. 381 crore into the stock. Incidentally, Dolly Khanna’s portfolio has two spectacular agriculture stocks in it being GNFC and LT Foods (Daawat). Both are also mega multibagger stocks and are likely to enrich her further in the future. Mohnish bought 7.79 lakh shares of Kaveri Seed Co at Rs. 487.29 each. The sum invested is Rs. 38 crore. The best way to understand the prospects of Kaveri Seed is to peruse the latest investors’ presentation. 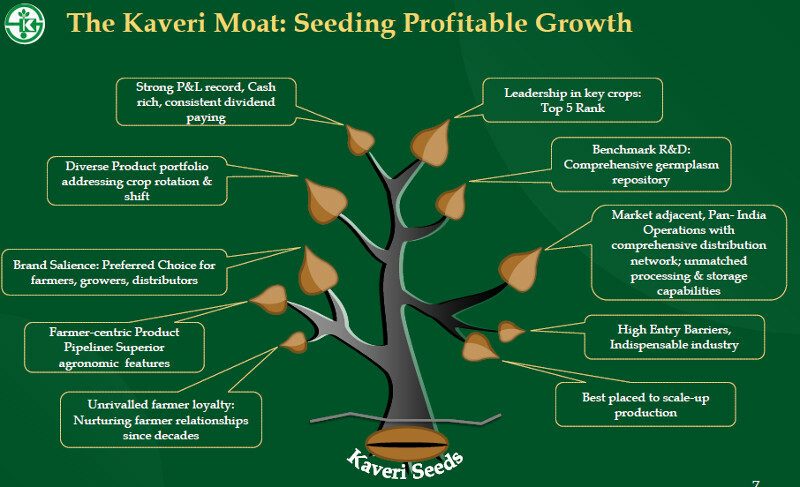 It is also claimed that Kaveri Seed has a “moat” and the same is depicted by this image. Kaveri Seed is not only debt-free but has a massive cash reserve of Rs. 500 crore. According to the ET, the Company has an ambitious game plan of expanding its business in high-margin non-cotton segment that include rice, maize and vegetable seeds by buying the latest technology. It is also aiming for at least 20-25% annual topline growth over the next three-five years. C Mithun Chand, the ED, revealed that due to focus on high-margin non-cotton business, there would be an attractive profit growth of 200-300 basis points more than the growth in topline. He also indicated that the company could surpass Rs 1,000 crore mark in annual revenues in the next couple of years. 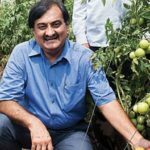 At this stage, we have to note that Billionaire Satpal Khattar has loaded on to Nath Bio-Genes, Kaveri Seed’s arch rival in the genetic seeds business. According to Mudar Patherya, Nath Bio-Genes is at the “cusp of unprecedented opportunities” and will shower incalculable multibagger gains upon investors. Mudar has given sound logic in support on his assertion. All that Mudar has said about Nath Bio-Genes prima facie applies to Kaveri Seed as well. Nath Bio-Genes is also targeting 25-30% YoY growth in revenues and profits. One aspect that is worthy of note is that both Repco Home Finance and Kaveri Seed are presently languishing at the bottom of the barrel in terms of returns to investors. They have grossly under-performed the benchmark indices. Repco, owing to the surging NPAs, has lost 24% over the past one year and 15% over 24 months. Similarly, Kaveri Seed, owing to its dispute with Monsanto over the royalty issue and other problems, has not performed well over the past couple of years. This is a blessing a disguise because it means that there are no lofty expectations embedded into the stock and so there is risk of a savage sell-off due to a disappointment. On the other hand, even a slight improvement in the operating metrics will be sufficient to send both stocks surging into orbit. This makes both stocks a textbook example of the “Heads I Win, Tails I Don’t Lose Much” theory propagated by Mohnish Pabrai in all of his lectures to novices! Wall street is better covered,more widely analysed ,hence it is definitely more difficult to find pocket of inefficiencies ,which is exploited to get investment returns. Hence mohnish’s steps seems quite logical. Mohnish and Shyam never seem to be on the same page.Its strange because both are value investors and seek margin on safety! Nath Bio Genes has a good run, though stock looks fundamentally strong technical are not supporting that strength. Therefore my confidence on it is low.